A prominent scientist Alexey Tyapkin was born on December 26, 1926 in Moscow. He has finished The Moscow Mechanical Institute in 1950. Qualification: the engineer - physicist. He was the member of specialized advice at Lab of physics of particles of Join Reseearch Nuclear Institute, Dubna. He was awarded by governmental medals of USSR. He was awarded with the nominal argentine medal of Czechoslovakian Republic (1967). He is Honored Figure of Science of Russian Federation (1997). Area of scientific interests: experimental high-energy physics, technique of detecting of fundamental particles, statistical methods of the analysis of experimental data, theory of accelerators, history of physics and development of interpretation of the modern physical theories. In 1952 Alexey Tyapkin has proved for the first time the capability of obtaining of the strong focusing of particles in an alternating magnet system of a circular accelerator. On the basis of this principle of a focusing in the Institute of Physics of Academy of Sciences of USSR there was developed a ring cyclotron. In 1955 irrespective of known italian physics M. Conversi he has offered a controlled pulse feed of gas-discharge counters and then has created first pulse hodoscope system with Geiger counters, on which one at the end of 1950-s has executed a series of experiments on measurement of polarization of protons in elastic рр- and np-dissipation. The same technique utilised by him and Yuri Prokoshkin in experiment on definition with a split-hair accuracy of a difference of masses of a negative and neutral pion the result in, published in 1966, flow 20 years remained unsurpassed on a measurement accuracy. Offered by Tyapkin the principle of a controlled pulse feed of gas-discharge detectors then became a basis of a technique, widely used in spark chambers of high-energy physics. In 1956 he has stated idea of creation of the spark chamber on the basis of a controlled pulse feed of flat spark counters, then there were some groups in Dubna, Tbilisi, Moscow and Yerevan begun mining of spark chambers and achieved large successes in development of independent directions in this off-the-shelf then to technique of track particle detectors of spark chambers with discharge along inclined to a field of a racetrack of a particle. In 1970-s under Tyapkin's management per the large physical installation - 5--m magnetic spark spectrometer for researches on a powerful proton accelerator was created in Serpukhov. In a joint experiment with italian physicists on this installation radially - exited state of a pions for the first time were discovered, the other known resonances (1980-1984) are confirmed. In 1975 for the first time he has stated the supposition about a capability of existence of charming nuclei as a result of easiest charming barion capture by a nucleus. The study on the given problem boosted experimental searches of such nuclear pieces and has set the stage for the whole flow of theoretical works. Versatility of his scientific interests was exhibited as a whole series of original researches dedicated practically the relevant problems of mathematical statistics, statistical physics, and history of physics also. Prof. Tyapkin first has decided a problem of the registration of background measurements at the analysis of events method of likelihood maximum and problem of small sampling for random events subordinating to exponential law of distribution. In the field of the statistical description of dynamic systems he has decided for the for the first time the problem of definition of a trajectory in a phase space is resolved on the basis of known statistical distributions separately for state variables. For the first time he has explained crucial importance of a macroscopic indistinguishability of microcondition for origin of an irreversibility in a statistical physics. He has obtained a series of the relevant outcomes on further recess of comprehension of a special relativity theory and quantum mechanics, including explicitly he has described conventional character of concept of a homogeneity. He has found out a main role of a universality of properties of physical processes in definition of appropriate metric properties of space - time. The international recognition of importance of his contribution in fundamental problems of physics became actuation him since 1988 in a structure of an editorial board of the “Foundations of physics letters” journal. Together with the colleagues he has discovered one more level of radial excitation of a pion having a mass 750 MeV. 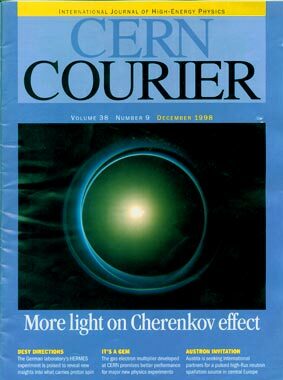 In his paper published in «the Brief messages of JNRI» (1993), he gives a substantiated conclusion about existence of new optical emission of a relativistic particle in gas, directional strictly forward along a racetrack of a particle as a result of the induced gear of emission at gas pressure lower than a threshold of Cherenkov emission. A subject of his candidate dissertation is «Derivation of neutral pi mesons by protons in the field of energies from 400 up to 660 MeV». The doctoral degree is adjudged for set of papers and report on the subject of «Application of gas-discharge particle detectors of high energy in experience on particle accelerators». Professor Tyapkin read courses of the lectures on «Statistical processing techniques and analysis of experimental data», «Modern methods of registration of particles», lecture on separate problems of a high-energy physics. 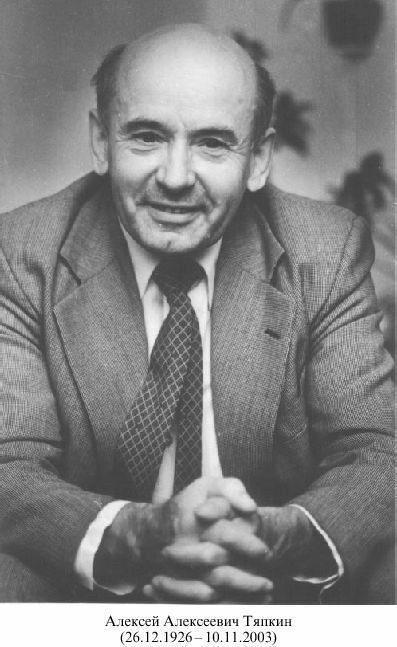 Alexey Tyapkin was one of the most talented physicists - experimenters, who perceived vulgarity of a Einstein's relativism, and attempted to find the consent of practice with a relativism of Lorentz - Poincare. In 1993 Alexey Tyapkin on the basis of Huygens - Fresnel Principle has made a theoretical prediction of the jump phenomenon of Cherenkov emission at overcoming of speed of light. This theoretical prediction has confirmed nitidously at experiment on ions of lead made by him in 1998 in CERN, Switzerland. In 1997 A. A. Tyapkin has executed experiment on detection of tachyons, particles driving with superlight speed. He destroys not only vulgar relativism of Einstein, but more attenuatous mathematical relativism of Poincare also. In last papers Prof. Tyapkin has shown an inconsistency of the speculative relativistic theory of Cherenkov effect created by Tamm and Frank (Stalin Prize, 1946 and Nobel Prize, 1958). He has published about 150 scientific works, including 2 monographies. Sources: http://nuclphys.sinp.msu.ru/epart/bio1.htm, http://www.h-cosmos.ru/, http://www.ufn.ru/ etc. Tyapkin A., Smorodinski Y., Lebedev P. Elementary of Particle Physics, UFN, Issue 2, 1960. Tyapkin A., Vishniakov V., Siao Vei, Low-voltage Halide Counters, UFN, Issue 9, 1960. About History of "the Relativity Theory"
The Experimental Indicatings on Existence of Tachyons, 1999. The Microscopic Nature of Radiation Basing Cherenkov Effect, "The Physics of the Atomic Nucleus", V.32., Issue 4, 2001. Sources: http://nuclphys.sinp.msu.ru/epart/bio1.htm, http://www.h-cosmos.ru/, http://www.ufn.ru/ and others. WEB-master expresses its sincere gratitude for all, who helped in creation of this memorial site.